Well, it seems like we don’t want this fancy schmancy £100 million mobile network on the London Underground after all. GoodMobilePhones.co.uk polled 1,094 Londoners and found that a surprising three quarters of them were against it, despite the advantages and convenience of being able to use your mobile on the Tube. On the Shiny survey – take it here – looks like the results were similar though a little less pronounced – probably because you guys are a techie lot. To the question: Do you want mobile signal on the underground? 55% of you said: “No – because it will make the Tube even more noisy & annoying if people are wandering about talking on phones” but 36% were definitely in favour. The reasons given for being against signal underground in the GoodMobilePhones survey included the fear that people getting their phones out on the tube would result in more theft, that other people’s calls would result in extra noise and irritation, and that operators would charge more for the service. (they won’t – btw). 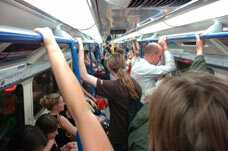 Take our survey and tell us more: Shiny Poll: Mobile signal comes to the London Underground – are you in favour?